The Thai Grilling Temple article in this month's Food & Wine magazine (June 2009) caught my eye and I decided to prepare some of the recipes. 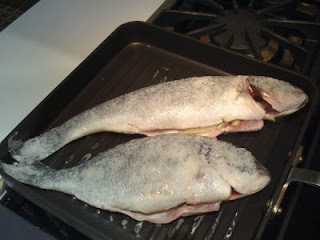 The salt crusted Tilapia with lemongrass looked really easy and tasty. 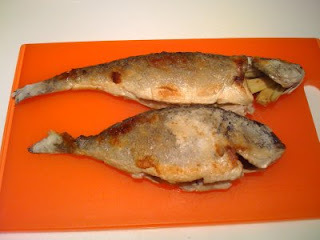 I ended up buying Branzini and Dorade because those were the whole fish that looked the best at the Chelsea Market. The recipe turned out to be fairly easily, but a little time consuming. Frankly, stuffing a whole fish with lemon and herbs and simply roasting it in the oven is less annoying and tastes much better. The pasting of the cornstarch slurry and waiting just was not worth the hassle. I grilled the fish on a grill pan indoors, so maybe that's the big difference, but I doubt it. I have to admit though, it was fun pulling off the salt crusted skin in one piece. As a pairing to the fish, I made the spicy citrus dipping sauce which as named is pretty spicy. Next time, I might lower the heat a little and reduce the liquid a little. But it was an excellent pairing for grilled fish. Tomorrow I plan on trying the grilled quick-brined jumbo shrimp, which I expect to be lovely with the dipping sauce. 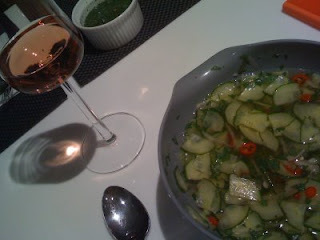 I also tried the picked cucumber relish which I found preferable the night it was made than the second night. This was very easy to make and really refreshing, spicy, sweet, and tangy. A wonderful simple side dish to fish, meat, etc. I'll use this again as a fantastic side dish at a barbecue. I did not enjoy this the second day because the freshness of the cucumber was transformed to a more pickled flavor and the shallot flavor dominated. I love cucumbers and to me losing the freshness is sad. I have more recently been cooking based on my own ideas and approaches, so following three to four recipes from one article in a magazine is a little unusual. I guess the magazine was successful - at least for the Thai Grilling Temple article anyway.